You are here: Home › Blog › What Exactly is Data Hub & Should My Company Use It? What Exactly is Data Hub & Should My Company Use It? • Product – Create/Manage: This is the primary tool included with licensing a GS1 Company Prefix, which is a centralized location for managing GTIN assignments and limited product data. Only one user account is included – access for additional users may be purchased. Rather than recording UPC (GTIN) assignments in local spreadsheet, companies can maintain their assignments online. Even though retailers do not use the Data Hub to discover products, the data structure allow users to export to basic fields to larger data services, if required by retail trading partners. Most retailers and marketplaces, including Amazon and Google, require significantly more product attributes and images. GS1 Barcode Service/Support subscribers get unlimited assistance with Data Hub product management. As of 2019, GTINs can never be reused so it is crucial that assignments are done correctly the first time. The “create” portion of the title is a misnomer since users do not create assignments/barcodes but rather associate product information with range of UPC numbers allotted to the licensed GS1 Company Prefix. Please note: the Data Hub does have a barcode function but these low resolution (.png) files are ONLY for representation and not for package/label design. They are not actually approved by GS1 and could result in unusable barcodes. EPS formatted files are provided as part of the GS1 Barcode Service. • Product – View/Use: Where the Create/Manage tools is geared for suppliers to enter data, the View/Use allows companies the ability to view product data. Companies must pay separate subscription fees to access this data. Mobile and web development companies can integrate their applications to pull data from the Data Hub. 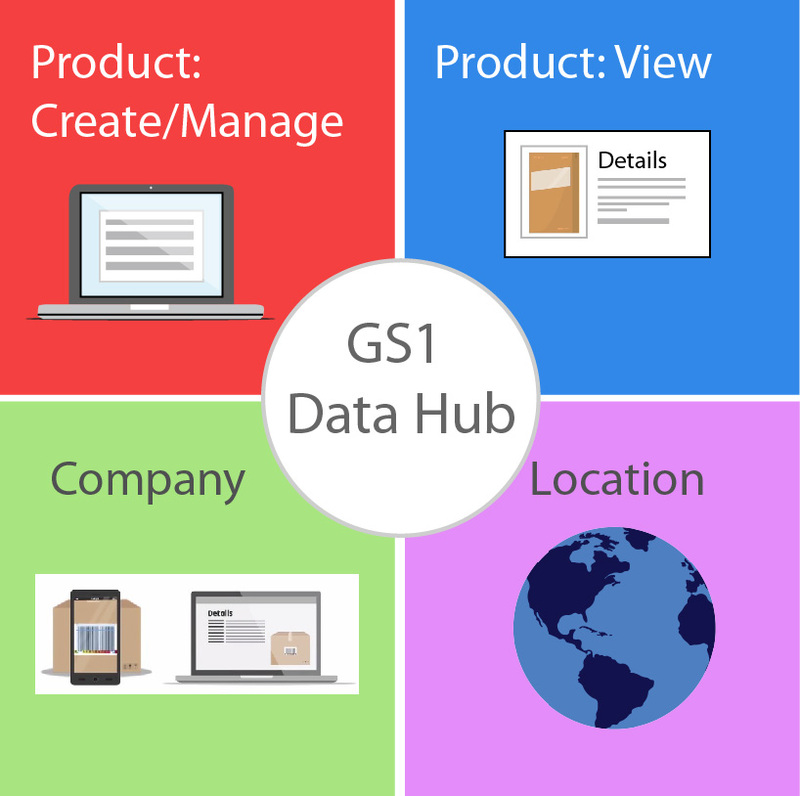 In our opinion, GS1 US is aggressively monetizing product data entered by their members and this information should be readily available without cost to all retailers and application developers to insure better quality data in the global marketplace. Please read “Who’s Controlling Your Online Product Content” to learn more about the importance of product data management. • Location: Using a similar model to product identification based on a globally unique Company Prefix, GS1 has established Global Location Numbers (GLNs) to identify locations. Industries including Retail, Healthcare, and Food Service, have integrated GLN assignments to improve business efficiencies. Companies with an active GS1 Company Prefix license have the ability to manage identifiers for their respective locations. A single user is included in the subscription and GS1 US has a fee structure established for additional users. Companies who wish to view and use GLN information can pay GS1 US separate fees to access the data entered by subscribing companies. • Company: This tool enables trading partners and 3rd party service companies the ability to validate GS1 Company Prefix against the GS1 US database of over 489,000 companies. Access to the Company tool is by paid fee subscriptions with rates ranging from $500 to $6500. Similar to the Product:View/Use component, we believe these fees are not necessary since Company Prefix validation by trading partners will yield improved global data accuracies and efficiencies. The free GEPIR tool can still be used for limited individual queries. To validate a Company Prefix from either a company name or GTIN, please click here. Despite its limitations, the GS1 US Data Hub Product:Create/Manage is a useful online application to manage product data in a centralized location. Since we administer barcode compliance for numerous retailers, we commonly see mismanaged UPC assignments when an individual within a company has kept the product barcode data on a local computer or didn’t train someone adequately on what needs to be done to maintain accurate UPC assignments. As an online repository, this allows new employees visibility on what has been previously assigned. As part of the GS1 Barcode Service/Support subscriptions, our individual barcode consultants can either handle all aspects of managing GTIN information for the Data Hub or simply validate the data entered is correct. GS1 is the global standards organization and GS1 US is the local US office. GS1 Global is currently creating a much large application called GS1 Cloud which will ultimately encompass all local GS1 offices and data pools. To learn more about the development of the GS1 Cloud, please visit https://www.gs1.org/services/gs1-cloud/how-gs1-cloud-works. Wait a Minute! Not All UPCs Will Work For Amazon?